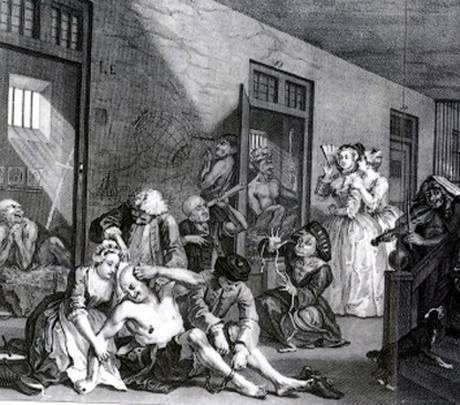 The word "Bedlam" has a unique origin that reaches back to the 15th Century. 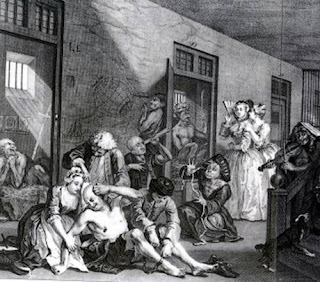 Its a highly contracted form of "Saint Mary's Bethlehem" on the outskirts of London, and Europe's first and oldest facility for the treatment of mental illness. Over time, this sanitarium's name shrank to the two syllable word that we have today. The word in its current state can be defined as "a scene or state of wild uproar or confusion". Its synonymous with words like disorder, chaos, clamor, or pandemonium (An interesting word in itself which can be defined as the abode of demons). I know this is starting to read like a wonky, boring bit on words, yet its rooted in something that struck me hard this morning while in the quiet space between my Radio Club breakfast, and the Saturday chores. Our Republic is in the midst of a Titanic-like slide into the depths Bedlam. Consider the world scene at present. A dark, medieval horde is sweeping over the near east with violence that echoes the Red Horse-rider of scripture. In-turn, they're driving a mass of humanity westward thats destabilizing Liberal governments and populations. Meanwhile at home, we're divided and balkanized in ways never seen in 240 years. There are casual calls for revolution by ignorant and uninformed minds whose only connection to bloodshed is through their playstation's or Xboxes. We're saddled with a usurper POTUS who has become a law unto himself and seems to possess a paraphillic-like compulsion to spend trillions of dollars which the Republic doesn't possess. To this point, the best we as a People have mustered to replace this willful king are an aging Socialist, a likely-felon, and a megalomaniac. The world is on fire, our Republic is burning, and America is consumed with celebrating and enabling gender dysphoria. How has the once most blessed and prosperous slipped into being a byword for national insanity in a generation or two? The causes are legion, yet I believe they can be distilled down to the fact that we have lost our collective way because we've largely jettisoned our God. Scripture is clear, along with the lessons of history. The nation that forgets the Almighty ends up in the ashes of its designs. Its also clear that nations repenting of their spiritual high treason can be restored and saved from destruction. I think the call is clear today. We who confess the Almighty as God, and Jesus as Lord are called to a season of repentance and prayer. We're all in dire need of turning more towards the Almighty and away from self. We've become complacent and nose-blind to the stench of our (MY) "respectable little murders" within the nostrils of the Godhead. We're approaching the National Day of Prayer. Even so, we shouldn't be waiting around for that day. Today is the moment to approach the throne in repentance and intercession on behalf of a nation adrift.